Bright as a rainbow in yellow, orange and pink! 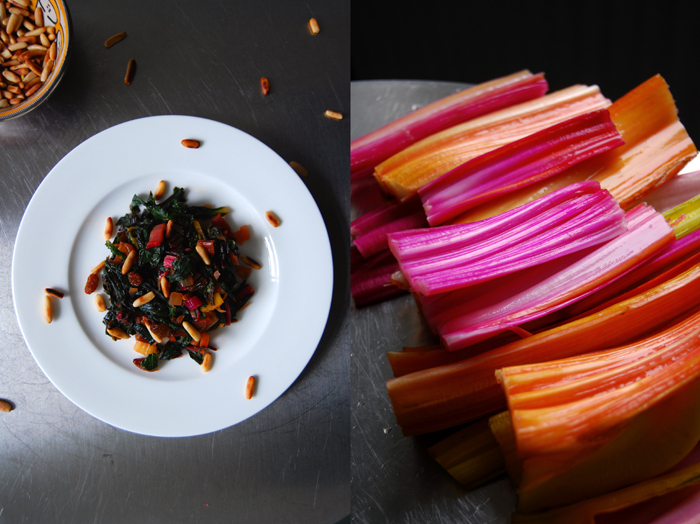 When I saw the pop coloured chard at the market I had to buy it in all of its shades although I didn’t have any plans to use them. On my way home, driving through the streets lined with golden trees at the peak of their autumn beauty, I had to think of Sicliy. We were there a couple years ago in July and the soft Mediterranean hills were covered in golden wheat, glowing in the sunlight like the leaves in the sky over Berlin. So that was my inspiration, Sicily! 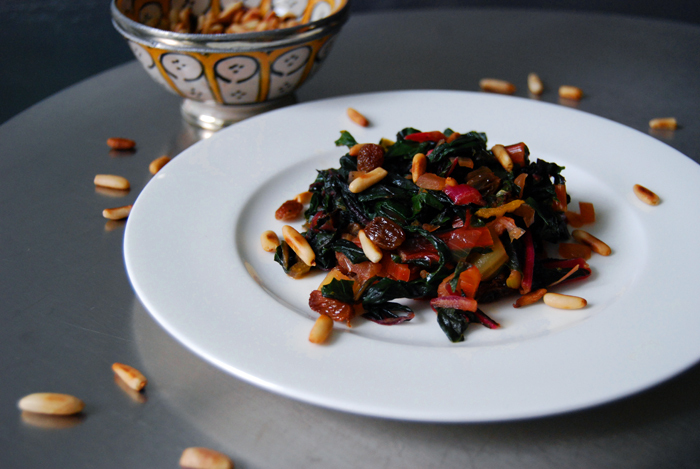 Sicilian recipes often combine the sweetness of raisins with the nuttiness of pine and both flavours go very well with chard. I sautéed the stalks first as they need a bit longer than the soft leaves which are done in a few minutes. The vegetable is refined with Balsamic vinegar, orange juice and raisins cooked in brandy. You could also add some cinnamon and orange zest, or a pinch of cumin. In spring, I wrote about my calamaretti in vermouth sauce which works with another Sicilian duo that’s just as good, raisins and salty capers! Roast the pine nuts in a pan until golden brown. In a sauce pan, bring the water, brandy and raisins to a boil, close with a lid and take off the heat. In a large pan, heat a splash of olive oil and fry the onions until golden and soft. 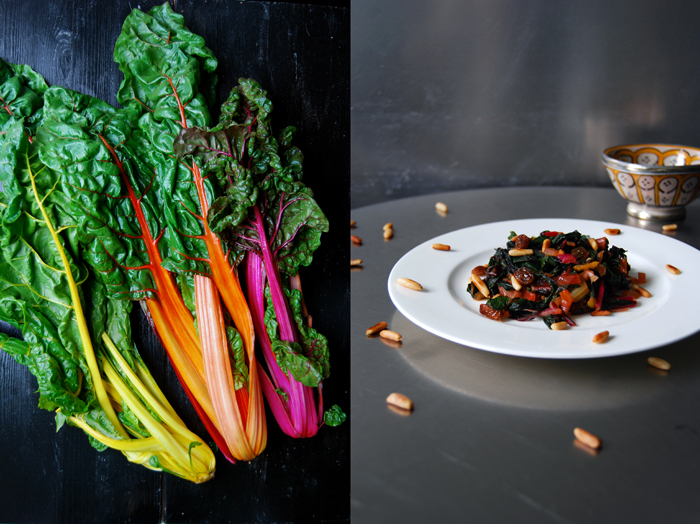 Add the sliced stems of the chard and sauté for 5 minutes on medium heat or until al dente. 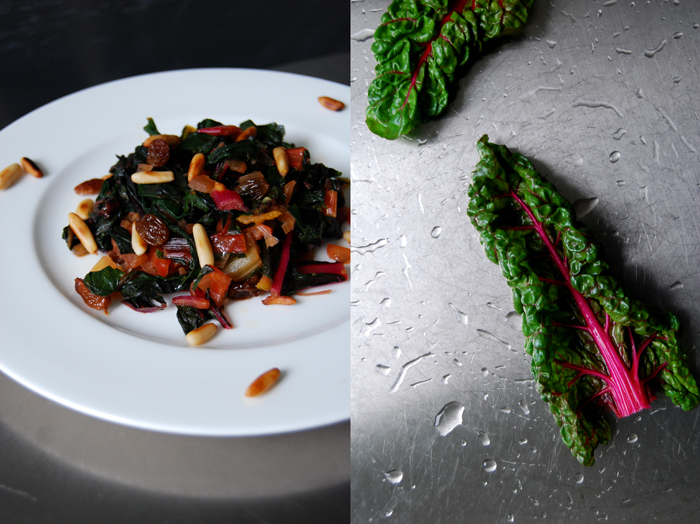 Add the chopped leaves of the chard, stir and cook for 1 minute. Add the vinegar and orange juice and the raisins in brandy. 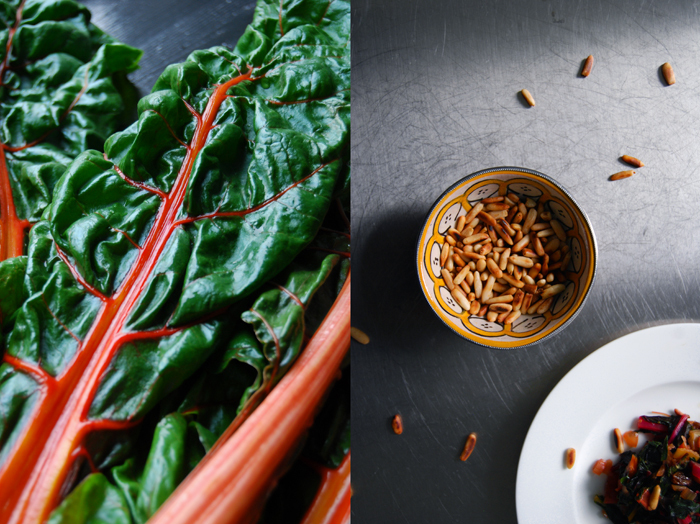 Season with salt and pepper to taste and cook for 2 minutes, sprinkle with the roasted pine nuts. If you like you could also add some orange zest and cinnamon.